THP 2-13-041 SIS (Buck Dog THP) Fruit Growers Supply Company, 1275 acres; 60% selection, 38% clearcut, 2% no-harvest, misc roadside logging. Marble Creek, Doggett Creek, Lower Beaver Creek (MD: T47N R9W Sec.26, 27, 28, 29, 32, 33, 34, 35). Winter operations, moderate erosion hazard, steep slopes up to 65%, landslide terrain, road failure sites, 111 road drainage work sites, herbicides, impaired 303.d watershed, coho watershed, 4 spotted owls within 1.3mi, scattered large trees. Estimated public comment deadline: 09/23/13. 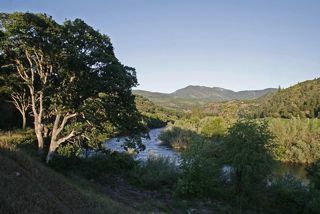 This THP is about 15 miles NW of Yreka, CA, near Highway 96 and Doggett Creek which flows into the Klamath River. Fruit Growers Supply company is planning a tractor and cable logging operation in mixed conifer stands, and amongst steep and unstable granitic and ultramafic based soils at an elevation of 2,300 to 4,400 feet. There are 9 wet areas, 7 active erosion sites, and 15 unstable areas including landslide terrain (hummocky ground, debris slides, wet ares), failures due to poor road placement, stream diversion failures, stream crossing failures and road bed, landing and skid trail failures. The THP includes 742 acres of modified selection logging which will allow them to remove a greater amount of white fir while favoring other mixed conifer species, and 483 acres of clearcutting. 111 road drainage work sites are planned including rocking, dip construction, culvert repair and replacement, ditch cleaning and road bed stabilization. Site preparation is proposed on steep slopes designed for cable logging, tractors will be used in 3 areas where slopes exceed 65%, and equipment will be used on slopes greater than 65% in the SW corner of Section 27 (where slopes do not flatten before reaching a watercourse). 2 skid trails are planned for use within a class II watercourse in Units 7 and 10 to skid logs, and Fruit Growers is requesting an exception to be able to construct and re-construct roads between October 15th to November 1st, and April 15th to May 15th. The THP area flows into the Klamath River which is an important Coho and steelhead fishery, and is listed as impaired for temperature, dissolved oxygen levels, excess nutrients and organic matter. The THP will also remove 10 acres of nesting habitat within .5 miles of Northern Spotted Owl nest site SK475. More information is available on the THP Tracking Center website.